No matter how you feel about today’s inauguration, take heart and consider the first swearing-in ceremony of America’s sixteenth president, Abraham Lincoln. On March 4, 1861, the country was a scant six weeks from entering the Civil War, seven states had already seceded from the Union, and rumors of plots to assassinate Lincoln were already swirling in the air. In addition to taking the helm of an ideologically divided country, Lincoln was the first president to be photographed at his inauguration. One image that survives the day is a salt-print photograph attributed to Alexander Gardner (1821-1882), a photographer in Mathew Brady’s Washington studio who would later earn fame for his photo-documentation of the bloddy battlegrounds of the Civil War. Gardner’s image of Lincoln taking the oath of office was made into an engraving published in Frank Leslie’s Illustrated Newspaper and circulated throughout the country. 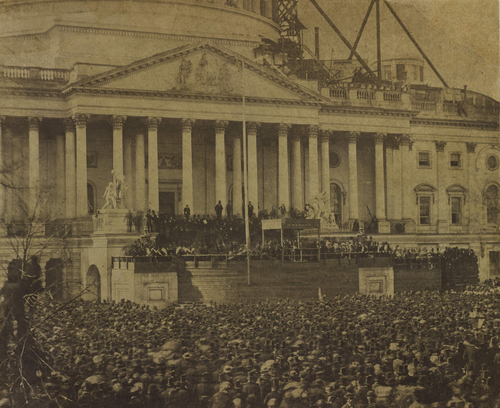 The black and white photograph shows Lincoln on the steps of the Capitol, a tall, dark speck standing above a crowd of 25,000 attendees. Scaffolding in the background reveals that the Capitol was still undergoing construction. Only three known copies of the photograph remain in existence: one is stored at the Library of Congress, another at the Smithsonian Institution, and a third was recently acquired at auction by Bowdoin College. The image has significant connections to the state of Maine; vice-president Hannibal Hamlin was a native of Paris, Maine, and longtime resident Winslow Homer was also in attendance, whose double-page engraving of the inauguration appeared in Harper’s Bazaar (Frank Lee’s competitor) later that year. Bowdoin College Museum of Art unveiled its acquisition to the public on January 12 alongside its copy of the Homer engraving. Inauguration of Abraham Lincoln, March 4, 1861, salt print, by Alexander Gardner, American 1821-1882. Courtesy Bowdoin College Museum of Art. No matter how you feel about today's inauguration, take heart and consider the first swearing-in ceremony of America's sixteenth president, Abraham Lincoln. On March 4, 1861, the country was a scant six weeks from entering the Civil War, seven states had already seceded from the Union, and rumors of plots to assassinate Lincoln were already swirling in the air. In addition to taking the helm of an ideologically divided country, Lincoln was the first president to be photographed at his inauguration. One image that survives the day is a salt-print photograph attributed to Alexander Gardner (1821-1882), a photographer in Mathew Brady's Washington studio who would later earn fame for his photo-documentation of the bloddy battlegrounds of the Civil War. Gardner's image of Lincoln taking the oath of office was made into an engraving published in Frank Leslie's Illustrated Newspaper and circulated throughout the country. The black and white photograph shows Lincoln on the steps of the Capitol, a tall, dark speck standing above a crowd of 25,000 attendees. Scaffolding in the background reveals that the Capitol was still undergoing construction. Only three known copies of the photograph remain in existence: one is stored at the Library of Congress, another at the Smithsonian Institution, and a third was recently acquired at auction by Bowdoin College. The image has significant connections to the state of Maine; vice-president Hannibal Hamlin was a native of Paris, Maine, and longtime resident Winslow Homer was also in attendance, whose double-page engraving of the inauguration appeared in Harper's Bazaar (Frank Lee's competitor) later that year. Bowdoin College Museum of Art unveiled its acquisition to the public on January 12 alongside its copy of the Homer engraving. Lincoln called for unity that day, hoping to keep war at bay. "We are not enemies, but friends. We must not be enemies. Though passion may have strained it must not break our bonds of affection. The mystic chords of memory, stretching from every battlefield and patriot grave to every living heart and hearthstone all over this broad land, will yet swell the chorus of the Union, when again touched, as surely they will be by the better angels of our nature."